Sofoniyas Worku, left, an 18-year-old student watches while hospice resident Joan Flack rests. A native of Ethiopia, Sofoniyas has experienced death before: he lost his aunt and a friend to malaria. Joan died on May 4, 2013. Photographs by Brigitte Bouvier. At The Harley School in Rochester, New York, senior-year students who sign up for hospice class learn to care for people who are dying. 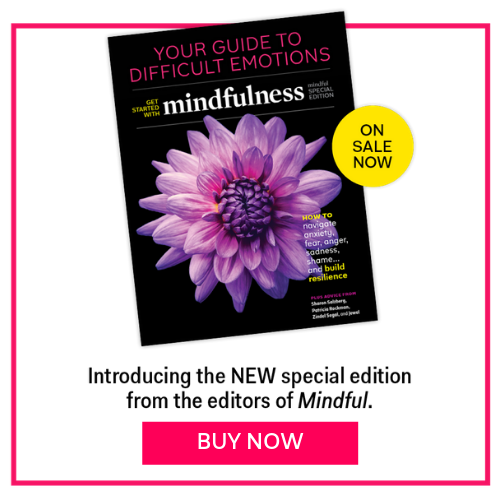 These are lessons in compassion unlike any other. “Have you done the Jumble yet today, Wendy?” Kayli O’Keefe has just bounced into Shepherd Home, a two-bed hospice-care home in Rochester, New York. The energy of the 18-year-old hoodie- clad teenager seems unexpected in a place where people go to die. She wants to know if someone has sat with Wendy yet so she could do her daily word puzzle. Wendy, 52, is a former speech pathologist and college professor. But she can’t answer Kayli. She has frontal lobe syndrome, and it has rendered her almost nonverbal. She can utter the odd word or the odd letter from the puzzle, but mostly she hums repetitively, almost hypnotically, and communicates by holding her pink-polished thumbnail up or down. It’s the cruelest of ironies for someone in Wendy’s profession. She will also die from it, which is why she’s living at Shepherd Home receiving palliative care. Her disease has progressed so quickly that no one would recognize her from the photo of “healthy Wendy” on the whiteboard in her bedroom. It shows a vibrant woman whose smile dominates the frame. Kayli moves closer to Wendy, who is doubled over by a bent neck, her eyes nearly closed, her face in an involuntary half-grimace. Kayli holds the newspaper and tells her what’s in the Jumble today. “The letters are R I N O Y. What do you think, Wendy?” Wendy is having a slow afternoon. Sometimes she can quickly blurt out the whole word, but this time she says only the first letter. No one else in the room can figure it out, but together Wendy and Kayli eventually do: IRONY. Kayli is a volunteer at the hospice, but she didn’t come to this work in the usual way. She is here as part of a senior-year class offered at The Harley School, not far from the Shepherd Home. It’s a unique program Bob Kane started 10 years ago at the private school. Kane is a beloved teacher whose graciousness and passion have attracted kids to the class, which is known in the syllabus simply as “hospice.” In the 2012-2013 school year, 36 of the school’s 44 seniors took it, up from nine when the course began in 2002. It’s popular. And at this critical time in their lives, when they’re about to go out into the wider world, it can alter their perspective about what’s important in life. On the first day of class in September, the students are timid and curious, unsure about what to expect. Jocks, preps, nerds—the usual high school labels fail to stick in the face of the experience of death. “They all come in afraid,” Kane says. “They come in wondering about everyone around the table. But the course calls to them because it’s real and it’s authentic. It’s extreme caregiving. “We sit around the table the first day and I ask them some questions,” he says. “Why are you here? What drew you in? And then the big one: What is your experience with death—any kind of death, pet, loved one, family member, friend? 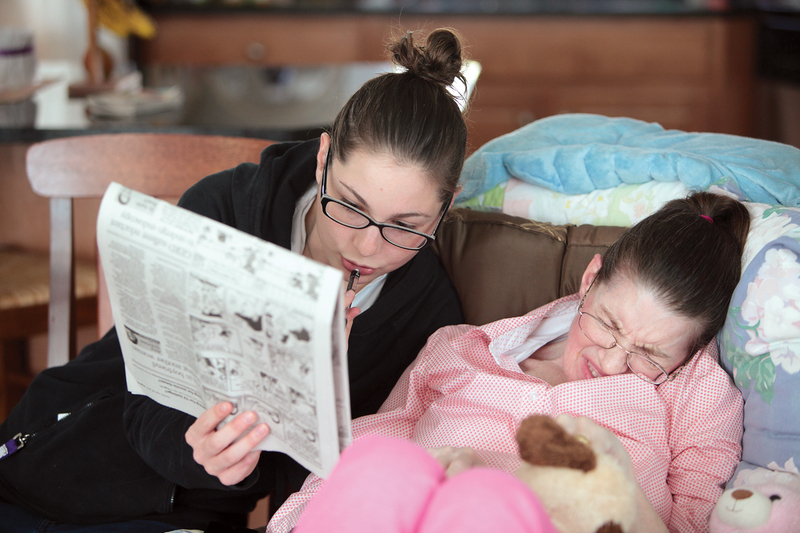 Student Kayli O’Keefe, 18, helps hospice resident Wendy do a word puzzle in the daily newspaper. The 52-year-old former speech pathologist had frontal lobe syndrome. Alejandra Biaggi, 18, recalls the first day: “Some of us were tearing up,” she says. “My grandfather died last summer, and talking about it was such a release. Nowadays death is so taboo.” But for students who take Kane’s class, it’s a subject they’re all able to talk about now. “Death is just a part of life,” she says. After the experience of opening up and coming together, Kane begins the hands-on training needed for hospice care: positioning residents in bed to make them comfortable (as part of the hospice philosophy, they don’t call them patients); changing the bed while the resident is in it; sponge-bathing, showering, feeding, hydrating, and applying lotion to delicate skin. At that point, the students begin to visit one of four hospice houses that have signed up for the program. Rochester has more two-bed hospice homes than any other city in the U.S. Under state law, hospice homes with only two beds are allowed to operate as homes, not hospitals. Add another bed and it becomes a legislated health-care facility, and the cost per bed jumps from $100,000 a year to $175,000 a year because of the need for full-time nursing staff. Two-bed hospice houses can run with one director, volunteers who come on two-person shifts from morning to night, a paid nursing assistant who stays overnight, and an on-call nurse who comes when needed, such as to confirm a death. The students sign up for shifts—there’s no set number they need to fulfill, but some become so dedicated, they elect to put in hundreds of hours. At that point, the classes at school become a forum where the students can share and process their experiences. Kane asks his students who wants to do the honors. “I’ll light it,” says Carolyn as she reaches for the candle sitting on the table in front of them. The candle is lit before every class. It reminds them that life is as fragile as the flickering light. It reminds them that in reality we’re nothing but a breath away from death. Once it’s lit, the students start sharing their experiences. Kane asks who’s had a shift recently and what happened. “At first, I was afraid to go into the rooms at hospice because I didn’t want to bother anyone,” says student Delaney Glaze, 17. “But I realized how much the families appreciate it. 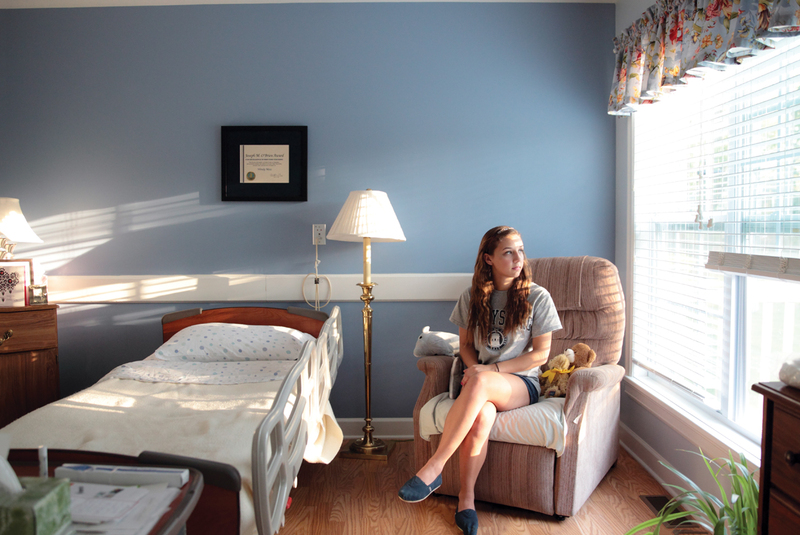 Now I feel much more comfortable with everything.” Delaney is sitting in resident Wendy’s room here. Wendy died on Aug. 30, 2013. Alejandra Biaggi chimes in: “His entire family was there on my shift, too, and they are such a joy. The atmosphere was so hopeful. That night, Madeline McGrain Githler is on shift at Advent House. She talks to Chet’s wife and son and does what she can to make him comfortable. The next day, the students find out that Chet died overnight. Madeline was on shift when it happened. After his morning class, Kane seeks her out. Delaney Glaze is working on the class’s yearend project, a quilt made of squares dedicated to the memory of hospice residents they met during the year. Delaney began hospice the same way her classmates did, but then it got personal. Her grandmother was diagnosed with brain cancer and had less than two months to live. Delaney approached the director of Shepherd Home where she volunteers, to see if she could get a bed for her grandmother. She arrived at the home in November and died in early December. The quilt piece Delaney is making is dedicated to her grandma. She has a photo of herself with her two sisters and her grandmother, which she’ll stitch on to the fabric from one of her grandmother’s favorite bead-covered shirts. Students take a few moments of silence after learning that hospice resident Chet Nothhard died. From left, Caitlin Richard, Meghan Sita Dewan, Saul Cohen, and Emily Hanss, with teacher Bob Kane. Beside her, Kayli O’Keefe is making two quilt squares. One is for Wendy, the former speech pathologist, and one is for her other favorite resident, a Dallas Cowboys fan named John. John’s square is a Cowboys shirt. Kayli now knows that a field goal is worth three points, but he taught her about more than football. “He was a huge a football fan,” she says. “Everyone would come over on Sunday—family and friends, all wearing their jerseys, and they’d watch football with him all day. David Marshall is an Emmy Award-winning documentary filmmaker who followed Bob Kane’s classes at Harley for two years. His not-for-profit organization, Blue Sky Project, creates and distributes documentary films focused on underreported social issues. In his film Beginning with the End (which is complete but has not yet hit the film-festival circuit), the question Marshall seeks to answer is: Can empathy be taught? Student Delaney Glaze, left, helps hospice resident Wendy to her room with fellow student Sofoniyas Worku, right. Marshall stresses that the students are just regular kids, something he managed to capture by giving them all video cameras and asking them to document what they do for fun outside of school. “It would be easy to see these kids as a special group of kids—kids who are somehow better than other kids,” he says. Is empathy something that can be taught? Bob Kane is circumspect. “I guess it depends on what your model of teaching is,” says Kane, who finished teaching the course last spring and now has plans to move to Ireland with his wife, where he hopes to create a place of spiritual reconciliation in a lodge they have acquired. Another teacher continues his legacy at Harley. “If you are looking at teaching as a structured profession where people get a curriculum and all these standards, I don’t think so. Kane uses the word “stimulate” deliberately. Because he thinks empathy is in all of us, and it just needs to be prodded. Jennifer Campbell is a freelance writer and editor living in Ottawa. She is editor of two magazines, Ottawa Citizen Style and Diplomat & International Canada.